You’ve purchased a premium PDF template through our online store. The next step is to install it on your website. Before you begin please ensure you have the Gravity Forms and Gravity PDF plugins both active on your WordPress website. Done? Good! Now let’s get you up and running with your new premium template. Once you’ve completed your purchase you’ll receive an email containing a link to your PDF template zip file – the email also contains your product key which will give you access to support: keep it safe! Your template can easily be installed through the PDF Template Manager which is accessed two ways: through the PDF global settings; or when you configure a new PDF on your form. We’re going to walk you through the later option as it’s quicker. Open the Shop Receipt email you received and locate the Your Purchases section. 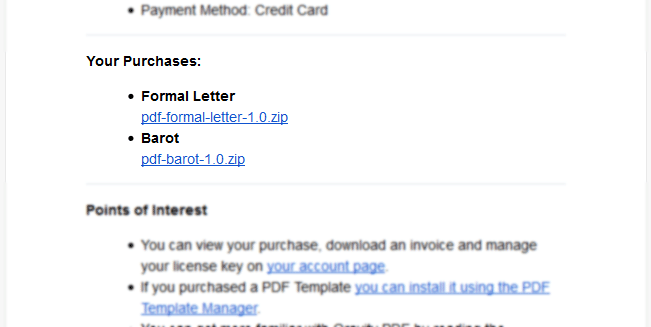 Click the link to download the template zip package. Login to your WordPress admin area and locate the form PDF settings by following these instructions. You should now be on the Add PDF Settings Page and will see an option under the General tab called Template – the option includes a dropdown of all your installed templates and a button labelled Advanced. Click the button to open the PDF Template Manager. A new window will open showing a graphical view of all your installed PDF templates. Scroll to the bottom of the window until you see a box with the text Add New Template. 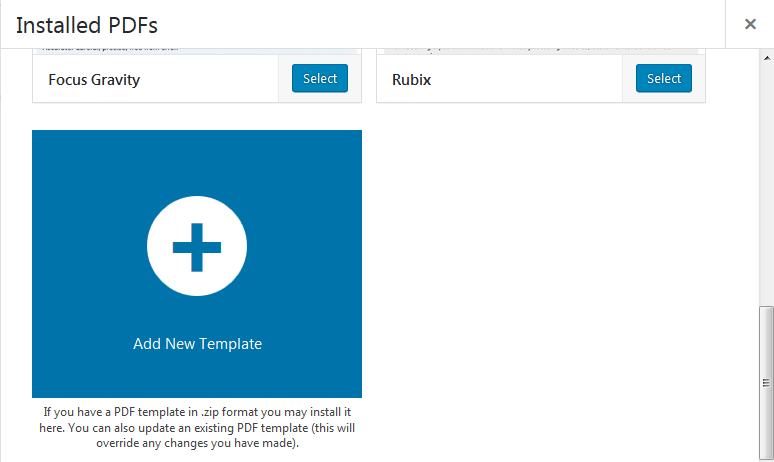 Either drag and drop the zip file you downloaded during step 1 into this box, or click the box and locate the zip file in the File Upload window that appears. If everything goes well you’ll see your newly-purchased PDF in the Manager. Next, click the Select button to use the template. The Manager will close automatically when you do this. Fill in the required Name and Filename fields and click the Add PDF button at the bottom of the page. 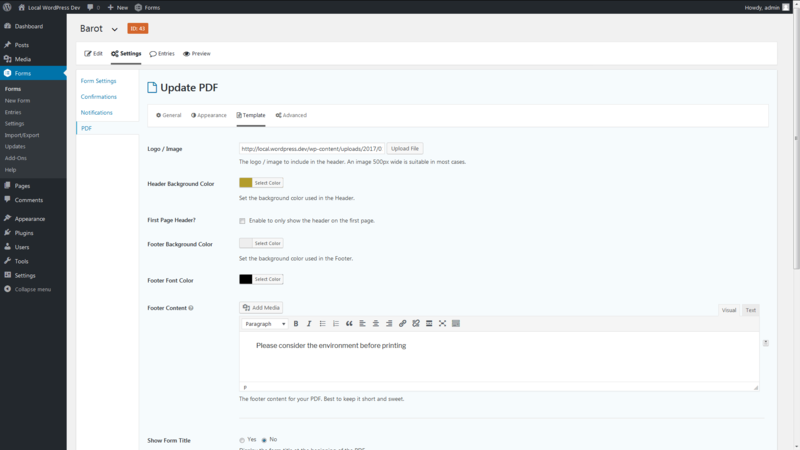 Navigate to the Template tab and customise your PDF. Don’t forget to click the Update PDF button when you’re done! Finally, view your PDF from the entries list page by hovering over an entry and selecting the View PDF link. If the list is empty you’ll need to submit an entry first. Warning: you’ll lose any changes you make to the PDF template file(s) during an update. Customisations you make through your WP Admin area are not effected. When a new version becomes available, download the updated PDF Template from your Account and follow the same installation procedure you originally took. Simple!